No tours this weekend - I was in Philadelphia. Next week on Tuesday, the Slater will have a special group of visitors. If you saw this view from a periscope during the last two weeks of May in 1944 you were in big trouble. It's a bow on view of the USS England (DE-635). Presidential Unit Citation - "For outstanding performance in combat against enemy forces from May 19 to 31, 1944. 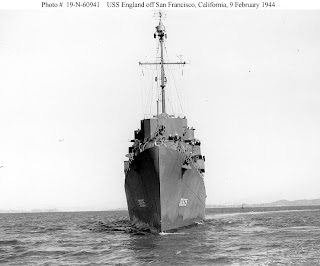 Utilizing to the full all available weapons and equipment the USS ENGLAND skillfully coordinated her attacks with other vessels and with cooperating aircraft, striking boldly and with exceptional precision at the enemy. In a sustained series of attacks, she destroyed six hostile ships within twelve days effecting this devastating blow to enemy operations during a particularly crucial period and disrupting attempts by the enemy to supply or evacuate key units. By this heavy loss to the enemy the ENGLAND contributed substantially to unmolested advance of the United States Fleet pointing toward subsequent seizure and occupation by our forces. A gallant and daring fighter, superbly ready ready combat, the ENGLAND has achieved an outstanding record of success, reflecting the highest credit upon her gallant officers and men and the United States Naval Service." During this week the Veterans from the USS England will be holding their reunion aboard the USS Slater.